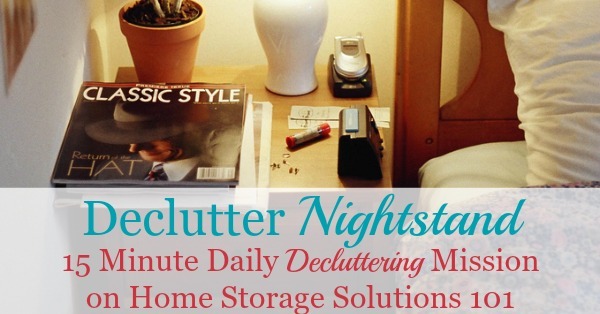 Today's decluttering mission is to declutter your nightstand. This is often an area where all kinds of things get piled, from late night reading material, cups of water, your glasses and more. Make sure to declutter the surface enough to get rid of anything that should not be there, and so you can actually access your alarm clock easily each night and morning, without fearing knocking stuff over or off! 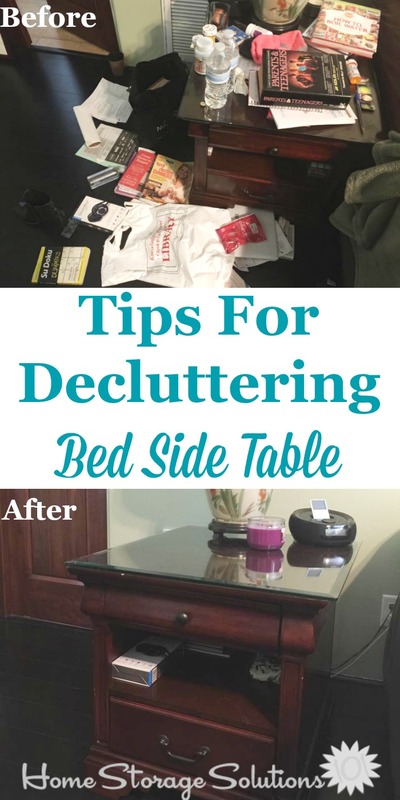 In addition, if your bedside table or nightstand has a drawer, clear it of clutter as well. Ready, set, go! Bonus points if you tell me what types of items normally accumulate on your nightstand and/or what you do to combat clutter and keep the space functional. 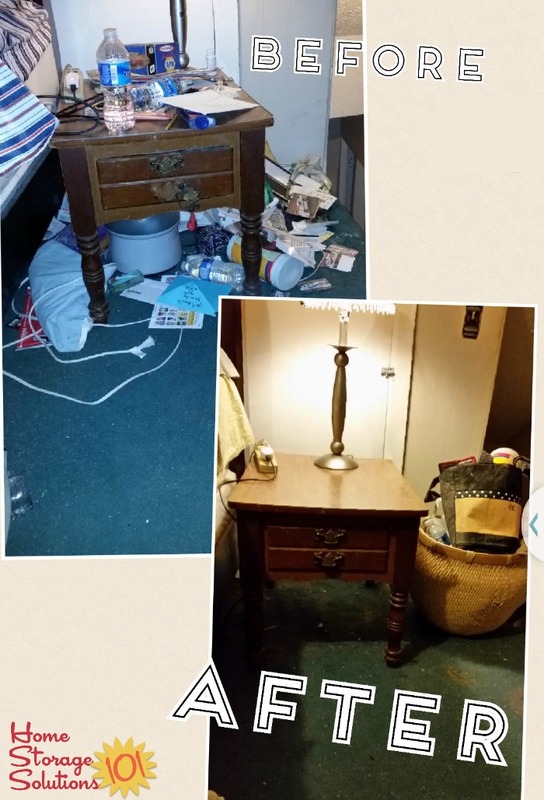 Further, below are pictures of bedside tables and night stands that readers have sent in, some of them decluttered and others that still need a bit of work, all for inspiration for you! 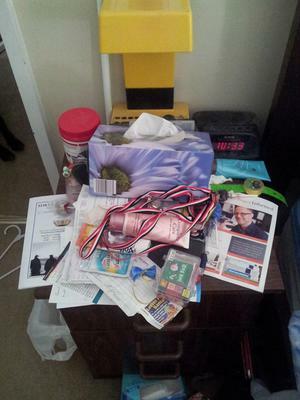 Eric provided this picture of his cluttered night stand. He's not alone in piling stuff onto this spot in your home. Other readers shared what types of things take up residence on this surface and don't seem to leave. Do you recognize any of these items next to your own bed right now? Now, I'm not saying all of them need to be cleared off. Some of these make sense in the location, such as your alarm clock. But many of them need to be moved to a different location, or at least regularly cleared off. Ear plugs, eye masks, etc. Personal care products, such as lotions, manicure equipment, etc. You can have whatever you want on your nightstand, but choose what you want to keep there carefully. You don't want so much stuff that it feels cluttered, or that it is difficult to access the things you do actually use regularly that you keep there. In addition, routinely, from now on, make sure clutter does not accumulate by putting things away where they need to go, after you're finished using them. 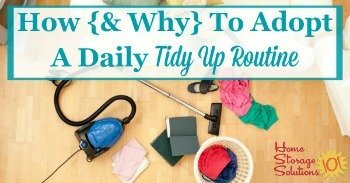 You can do this as part of your daily tidy up routine. You can learn more about this necessary and important routine at the link. Ellen shared these before and after pictures, shown above. She stated, "Everything gets dumped here. Kids stuff. My stuff. Random hand bag stuff. I cleaned off and (tried) to put everything where it belongs. Now I need to tackle the dresser. Thanks for these 15 minute challenges!" The photos above are from another reader, Sabrina. She said, "I love how I'm so energized after cleaning the kitchen! I couldn't settle down so I cleaned my night stand!!!" She continued, saying about the after photo, "15 mins later after sorting and wiping!" In addition, these photos were sent in by another reader, Kimberly. She said, "This is such an embarrassing photo, but that's why I joined the Declutter 365 group. My whole house was cluttered and I'm gradually getting it under control. I'm so thankful that I found this group and that Taylor created it. My nightstand was a nightmare. I've only just begun. I need to vacuum and sort through the basket of clutter but I have such a better handle on it now because for over a month I have been creating homes for my items and it's so much easier to put things away when they actually go somewhere! :) What a blessing this group is." I'm so glad you found this site and the accompanying Facebook group too Kimberly! And you should be proud of what you've accomplished! Well I think everyone should have a hanger, a Tupperware bowl, a plastic bag, a new wallet etc. on their bedside table. This is the worst my night table has ever been. Oh, and a baby monitor (fyi my kids are 8 & 9). I haven't used it in years. I don't know where it even came from. Wow that is bad! It will be done before I go to bed. That's the spirit Lynn! It looks like a lot but really it shouldn't take too long to clear it off and you'll feel so much better! "My nightstand is a bookshelf and I have lots of medications and medical things needed so it gets cluttered and a mess very easily! Ideally, the top is for drink and evening snack and a scentsy melter, first shelf is a basket of bills for the week medications, and books/magazines currently reading, and second shelf is my daughters and mine "craft" shelf- paper, markers, cross-stitch etc. As you can see in before pic it becomes overloaded EASILY." Here's some more pictures from additional readers, the one below is from Tina. 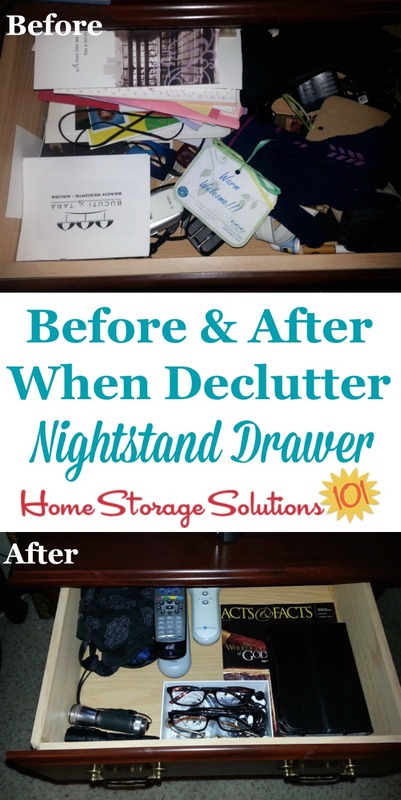 In addition, don't forget to clear the clutter not just from the top of your nightstand, but also inside the drawers. 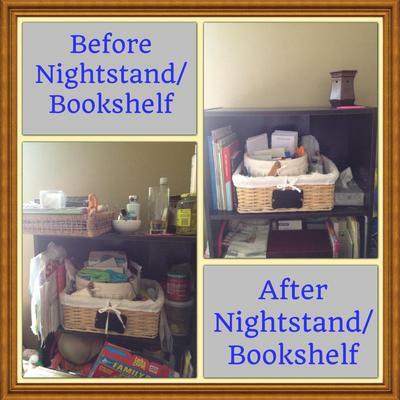 Here's a before and after from another reader, Liz, who decluttered her night stand drawers. Yay Me! I Got It Decluttered Today! 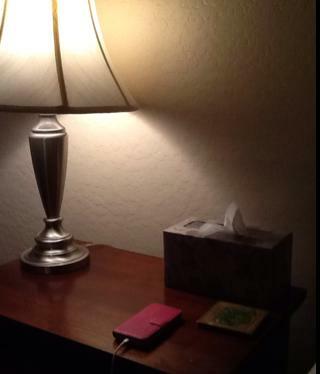 Lamp, cell phone hooked to charger, iPad hooked to charger, Kleenex box and coaster. The pile of junk "to do" is gone, as is the wireless device "organizer" that was a dust trap. Yay me. I hope seeing these pictures has inspired you to get your own nightstand or bedside table cleared off. Bedside tables are, of course, a type of flat surface, and these types of surfaces attract clutter all the time. 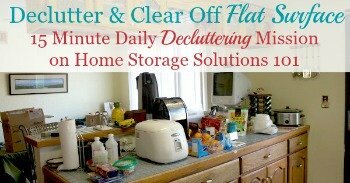 You can get more tips for how to declutter flat surfaces here. In addition, make sure to declutter and organize additional items in your bedroom. 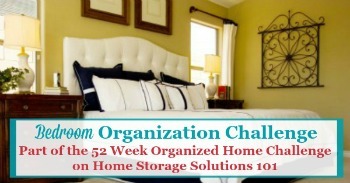 You can get more tips in the Master Bedroom Organization Challenge here. Comments for Yay Me! I Got It Decluttered Today! I purchased a pocket that goes on the side of the bed. It holds all my remotes so I can get them off my nightstand. I have small baskets in my drawer to organize small items so they don't get lost and I limit the top of my nightstand to lamp, small box to organize my sleep masks and earplugs, journal, book, tablet and phone, all of which are neatly stacked. I generally declutter them every morning when I get up and make the bed. I clean off both night stands. 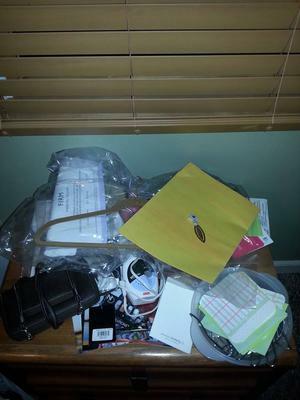 It's funny that you decided to do a nightstand declutter. I just bought a new end table to replace my night stand. I found that the nightstand is too small and short. We inherited a nice bedroom suit from my mother in law. It has the normal bed, dresser, chest of draws and nightstand. I went to the local Goodwill and found a nice end table, with a drawer. It's a little light in color. But that can be fixed. I plan on doing some rearranging tomorrow. I use a little ceramic bowl my son made in art class to put little items in. For example: The earrings I accidentally wore to bed or a Bobby pin left in my hair. After seeing the pictures of the transformed night stands it has given me the inspiration to move the recliner that is currently serving as my "night stand" and catch all for a real bed side table. I moved the chair in to our bedroom in 2012 after my husband's motorcycle accident so he could sleep in it. Now it just collects everything and has my alarm clock etc. in it. It is a huge mess! I need my neat table back! As I read your nightstand mission for today, I glance over at my nightstand. What accumulates? A glass of water, alarm clock, 25 foot tape measure, a my little pony, many hair bands, and tree bark. Yep, a pile of tree bark. Fan, on all year long for white noise. I have realized that after you live with clutter long enough you stop seeing it but it really effects your mood when everywhere you look things are messy or you have to keep moving things out of your way to get a task done. I now see that by throwing things out and putting things where they belong I will have a more peaceful feeling inside too. so much easier now that it is cleared off! I got to and cleared my nightstand a couple of months ago putting things I still need to have to hand in the drawers, it is so much easier to now have space for my glasses and phone when I go to bed. Whats on mine? Oh boooy..
Magazine organizer that's supposed to help with clutter. Not in it is my new credit card I need to activate, a note book, pictures my daughter refuses to let me throw away, etc., two purses, bottle water, cup from my kid, iPad phone and chargers, remote and wireless headphones box of tissues. I just cleaned it SUNDAY! My nightstand is the home of my medical equipment including a nebulizer. 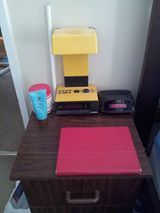 In addition there is the phone, iPad, box of Kleenex and the plastic dishwasher bottle basket used for nebulizer pieces. The drawer of the night stand holds my clean nebulizer mouthpieces and inhalers. As I use a mouthpiece I place the dirty one in the dishwasher basket so that when it is full it goes in dishwasher. I keep just enough mouthpieces that I keep two in the drawer clean while the others are being cleaned. All are marked with the date of first use so that they are replaced in a 6 month cycle. It's an organized system that works well for this ADD unorganized person. Ok, I feel better now that I know someone had tree bark on her nightstand. I can certainly get rid of my extra books, papers, etc! Thanks, "tree bark anon" for giving me a laugh and HOPE! I have one of those mail organizers (one of those upright ones with 2 or 3 slots for mail/papers) that I put remotes in. The cable remote is too big for it, but it does get the TV and BluRay remotes out of the way. I like the basket in a basket idea. I have my ice tea, face creams, books, glasses, pictures, cell charger, some nail necessities. Never realized the effect the clutter had on me. I receive donation letters, well bottom drawer was full. Top drawer would close since I place mail, newspaper, held purse on corner. I threw away almost everything without guilt. I bought desk trays for $1.00. Placed meds, lotion, few stationary. Bottom; CDs, journal, candles and tissue box. I only have lamps, a Kleenex box, and an alarm clock. All other items are gathered in baskets in the top drawer--reading materials are in a basket beside the bed. Works for me! I use a silverware tray in my night stand drawer to organize my stuff. I went to local Dollar store and bought some small plastic baskets for my drawer and it really helps. On top of my nightstand is my CPAP machine, bottle of water, reading glasses, Chapstick, remote, etc. I also use a cosmetic bag to help organize medication, nail clippers, and other personal items. You asked what type of things are on my nightstand: I have a small floating shelf which can't hold too much - that was quite deliberate. I have a small Bible and 2 other favorite books on the shelf. I have found that a pretty cup and saucer set is not only a decorative accessory, but is perfect for holding things. In the cup, I put wrapped cough drops, while I place my earrings and bracelet from the day on the saucer. Pretty AND practical! I also have a small (about 7" diameter) basket to hold the remotes for the TV, lights and fan, as well a a pen. There is still room leftover for my glasses as well as a coaster for a drink if necessary. Underneath the shelf is a rectangular basket that holds a healthy, but neatly contained assortment of magazines and books. That's it. It looks neat and uses some of my favorite items to create a cozy bedside nook! I have a lamp and and an alarm clock on my night stand with an occasional glass of water. That is all that is there. My night stand is terrible. Mountain Dew bottle, water glass, necklaces, rings, earrings, movie stubs, screws, change, nails, pens, mateless sock...That's not even all of it! You say to declutter and put things where they belong. Well that's always my problem. I just don't know how to decide where things should go. 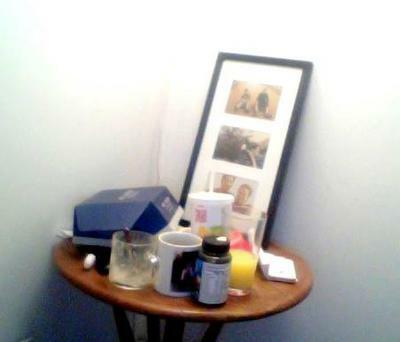 I have a lamp, my clock radio, my medication that I take first thing in the morning, and water mug, a book I read nightly. My nightstand has a drawer that really needs clearing out! Well, I feel rather virtuous in that my nightstand doesn't hold a lot of stuff. Neither does the drawer, but what IS in the drawer is totally unorganized. THANK YOU all for the basket/tray ideas! I'm heading to the dollar store and will organize the bits and bobs in that drawer! We moved here 20 years ago and had only one nightstand in our room and only one place to plug in a lamp (after the other outlet blew up a lightbulb!) So, my side had a chair. You know what happened. A foot of clothes that were good enough to wear again, a basket with a few books, a rolled up sleeping bag?? A store went out of business a couple of months ago and I bought a nightstand for my side!! I found a floor lamp, too, which went by the LR desk; that lamp went to the sewing room; that lamp went to my new nightstand. It presently has the lamp and a square basket that holds two books, change, and any little thing that ends up there. The top drawer has a Bible, glasses case, any small things that might be wanted at night. (There is a second drawer with nothing in it--I was going to use it for socks and undies, but found that the underside of the drawer frames were rough and unfinished and snagged material. Boo.) I put a drink bottle on the floor when needed, because I don't want to mess up my nice new surface. There is a cat bed (unused, of course) under it. The chair ended up at the sewing table. On the other nightstand...lamp, tissue box, stack of books, full drawer of medical papers, and a shelf with about 8" of things, plus he keeps his shoes under the stand! Thanks for booting me into finishing this job as I write this looong comment. No pics, since I didn't know I was doing this. My most successful decision tree is "where would I want to look for it?" A lot of people think my kitchen is weird, but the knives are in the drawer next to the stove because that's where I use my cutting board; the glasses are in the cabinet above the stove peninsula because it is closest to the dining room table, rather than the sink where I do dishes. Those are easy. I want my gardening items by the back door! I hung a shoe organizer with clear pockets by the back door landing and look there for tools, twine, bug spray, gloves, etc. I look for my out of season clothes in the guest room--underbed boxes or empty drawers in the dresser. I look for my medicine in the kitchen cabinet. My husband looks for his in the dining room hutch. We look for medical papers in the nightstands. If things get too piled during a hectic time, I pack them in labeled banker boxes and turn them into a shelf by the computer desk. The labeled side is out and they are covered with a cloth that calms the area. (And the cat sits there to look out the window instead of in front of my monitor!) I know where to go for an empty notebook, file folder, or where to find papers from our parents' estates without using up the file cabinet space. They are eventually rehomed, reused, or move farther into the archives. We seem to be the location for both sides of the family. Oh, well. And now these boxes are calling me to work on them and see what I can get rid of today; I already have more empty space on my computer desk!! What about a CPAP and its long hose & ugly mask? 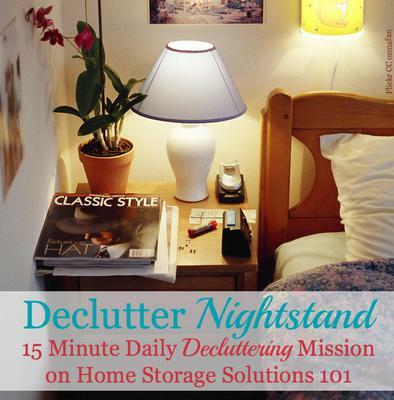 Would take me way more than 15 minutes to declutter my nightstand. Could toss it all in a basket and dust it in 15 minutes but the hard work is putting away stuff that doesn't belong on it and not end up with one more basket of stuff. I recently got a 3 drawer nightstand and my 2 drawer went to a charity. What a difference that made! However, the lamp was too large for the space. I got a smaller one and that made a difference as well. Every little step is making it better but somethings linger, i.e., medicines, charging cords and nail tools.